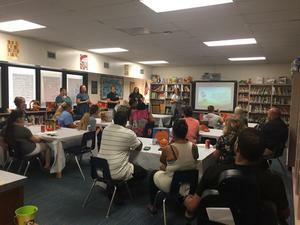 Ruby Elementary hosted a family literacy night in which our interventionists and Reading Recovery teachers shared some reading strategies and other tips on how to parents can help their child at home. Each child that attended the family literacy night was given a pack of books to take home. RES teachers had a fun after school social tye dyeing school themed shirts! We can’t wait to wear them! We think the kids will love them! Congratulations to Mrs. Kim Sowell - the RES ABC employee for October! Mrs. Sowell teaches kindergarten. She is a true example of ABC employees because she goes Above and Beyond the Call of Duty every day for our students. Thank you, Mrs. Sowell! RES appreciates you! Third Grade student, JJ Cook , has been named the RES Student of the Month for October! JJ's's teacher, Mrs. Byrd says, "J.J. is a sweet and smart boy. He is always sharing and showing kindness to others. J.J. puts forth effort with his school work everyday." Congratulations to JJ on being chosen Ruby Elementary's October Student of the Month! 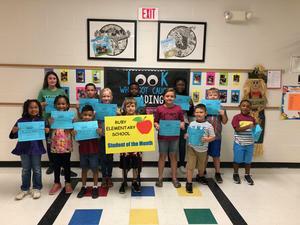 The RES Student of the Month is sponsored by the Chesterfield High School Alumni Association. JJ has been provided a sign to display proudly in his yard during the month of October! RES is also proud of all the classroom nominations. These students were presented with a certificate and coupon for a free scoop of custard at Highway 55. They are as follows: Kingston Williams, Kyndal Poulson, Jamison Miles, Kandace Robbins, Lucas Miles, Brayden Wright, Graciana Robbins, Eli McLendon, Avery Moss, Amani Allen, Blayden Thurman, and Kathryn Johnson. Keep up the good work! RES is proud of you! 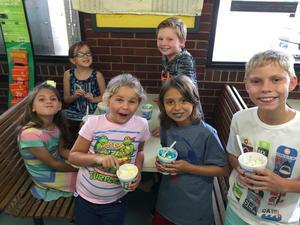 Six students were treated to lunch and ice cream as a reward for completing the Quantile Summer Math Challenge. Their work during the summer paid off! Third Grade student, Christopher Ojeda, has been named the RES Student of the Month for September! Christopher's teacher, Mrs.
Byrd says, "Christopher was chosen as Student of the Month because he always uses great manners and shows respect for his classmates and teachers. Christopher is a hard worker and constantly has a smile on his face." Congratulations to Christopher on being chosen Ruby Elementary's September Student of the Month!" Christopher has been provided a sign to display proudly in his yard during the month of September! RES is also proud of all the classroom nominations. These students were presented with a certificate and coupon for a free scoop of custard at Highway 55. 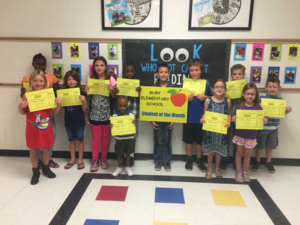 They are as follows: Cody Hancock, Hunter Helms, Alaina Griggs, Jackson Burch, Analyn Oliver, Taylan Irvin, Johnathon McLoyd, Denise Morant, Dionna Myers, Zoey Cooper, Olivia Rink, Wynton Bell, and Laken Linton. Congratulations to Mrs. Rebecca Tolson and Mr. James Moser - the RES ABC employees for September. Mrs. Tolson teaches fourth grade and Mr. Moser is our custodian. Both of these employees are true examples of ABC employees because they go Above and Beyond the Call of Duty every day for our students. Thank you, Mrs. Tolson and Mr. Moser! RES appreciates you! Ruby Elementary would like to congratulate Natalie Douglass for being voted the Best School Teacher of Chesterfield County. Check the ad out in the Shopper to read more about Natalie! We are so proud of you!